Neil Sinclair was one of the first to benefit from advanced catheter ablation, a new electrophysiology procedure we brought to Victoria. When electrophysiologists Drs. 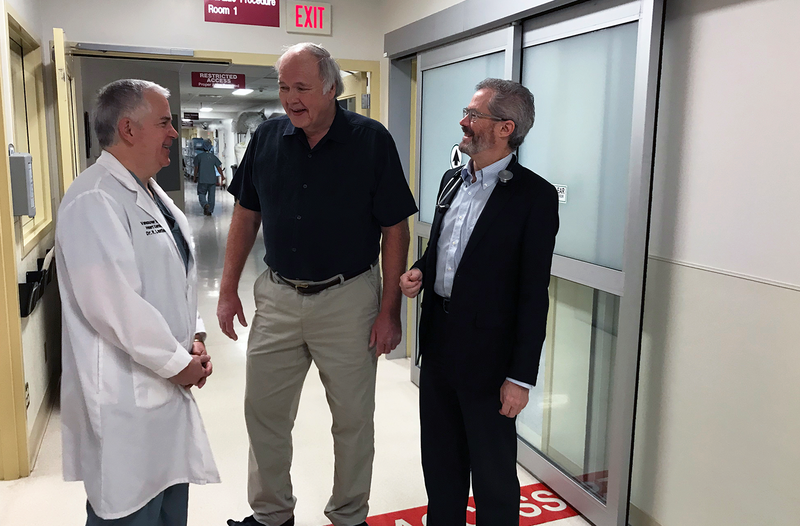 Rick Leather and Larry Sterns met Neil, his arrhythmia predated the technology to fix it. Due to faulty electrical pathways, his heart was beating too fast and inconsistently, which left him tired, unwell and at high risk for other health issues including stroke. Since surgery was not a treatment option, the new catheter ablation procedure was the only treatment that could give him relief and restore his quality of life. We’ve come a long way in the last twenty five years. Today, thanks to equipment and technology funded in part by community members like you, we can provide the latest treatment and give people like Neil a new lease on life. Heart issues run in my family ― my father had a triple bypass. Even so, I never thought any heart-related matters would happen to me. I don’t think any of us are ever ready for that. It started in 1993 when I was 45 years old. I had a butterfly feeling in my chest and was quickly diagnosed with cardiac arrhythmia, meaning my heart didn’t have a regular rhythm. The electrical signals that controlled my heartbeat didn’t work properly. I had two types of arrhythmia: atrial flutter which gave me a racing heartbeat and atrial fibrillation that caused my heart to beat irregularly. It was shocking to hear this news, and the first few years of my cardiac journey were very stressful for my family, for me and for others around me. Having arrhythmia, it taxes you. You live with this constant reminder that something is not right. I tried drug therapy and it provided limited benefits, but often I had to go to the Emergency Department for cardioversion, a procedure where an electric current is sent to my heart to reset its normal rhythm. At one point, I had to go to Emergency three times in 11 days ― it was just too much. My physician referred me to Dr. Sterns and Dr. Leather at Royal Jubilee Hospital ― both passionate, caring and innovative electrophysiologists. Over the years, they never gave up on me. In 2005, they started talking to me about advancements in electrophysiology, a branch of cardiac care that studies the electrical component of the heart. They gave me hope that I would one day be able to have my life back. In 2011, I had my first ablation treatment. The innovative procedure was conducted by Dr. Leather, who inserted a catheter through my groin, threaded it to my heart and gently scarred the faulty pathways that caused the atrial flutter. I woke up from the procedure with immediate relief. In fact, I remember doing a victory lap around the Cardiac Short Stay unit shortly after and going home to my wife that very same day. “I’m a new man!” I said to her. My heart then continued to beat normally for several years until my other cardiac issue, atrial fibrillation, caught up to me. In 2014, I had a second ablation procedure and it was performed by Dr. Sterns. This time around, the procedure was more complex but again, the Heart Health team did not let me down. The procedure worked: the scars left by the ablation stopped abnormal electrical signals from moving through my heart. I have only had two arrhythmias since receiving the second ablation procedure. I can’t tell you how it feels to have my life back again, to be able to travel without the fear of having to rush to an Emergency Department of a hospital in a distant locale and to live without the anxiety of my heart not working properly. Having cardiac issues can put your mind in a dark place, but what helps is knowing we have the best Heart Health team right here in Victoria. I am one of thousands of people who have been helped by the incredible Heart Health team at Royal Jubilee Hospital. The technological advancements I have witnessed since 1993 are unparalleled, and I trust that Dr. Leather, Dr. Sterns and their colleagues will continue to provide the latest procedures and the very best care to our community with access to the critical equipment they need. Please consider making a donation and supporting those who save lives. This gift is a gift to the health of our community.